Some (I hope exaggerated) reports say that well over a hundred people were killed in the southern Syrian city of Dera’a yesterday. And after Friday prayers today, enraged Syrians took to the streets in nearby Sunamayn, in central and suburban Damascus, in towns such as Tell and Ma’adumiyeh in the Damascus countryside, and in the cities of Homs, Hama and Lattakiya. They chanted “God, Syria, Freedom – That’s All,” and “With our Souls and Blood We Sacrifice for You, O Dera’a.” And they did sacrifice; reports suggest that many more were killed and injured by the state’s bullets this afternoon. 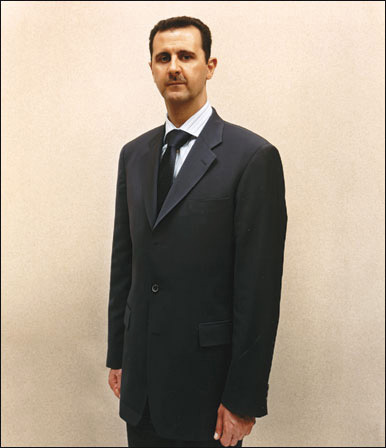 The officially-sanctioned chants usually heard in Syria promote sacrifice for President Bashaar al-Asad. Today a group of pro-regime demonstrators rather lamely replaced Freedom with Bashaar, as in “God, Syria, Bashaar – That’s All.” But it doesn’t work any more. Bashaar, previously perceived by many as innocent of his father’s regime’s crimes, now has blood on his hands. His name sounds like the antithesis of freedom. A few weeks ago fifteen children were arrested in the southern Syrian city of Dera’a for writing revolutionary slogans on walls. This led to a series of demonstrations calling for the children’s release, the sacking of local officials, and an end to the decades-long state of emergency. 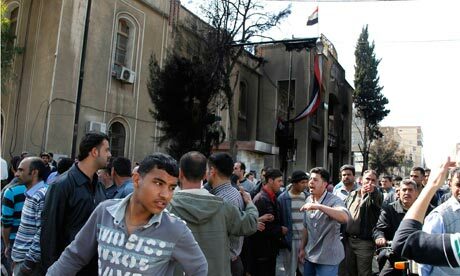 Last Friday security forces opened fire on protestors, killing five people. Predictably, state violence redoubled the people’s rage. A Ba’ath Party office was burned and a phone company belonging to the president’s corrupt cousin Rami Makhlouf was attacked. Inspired by Tahreer Square and Pearl Roundabout, protestors then set up tents beside Dera’a’s Omari mosque and stated their intention to stay until their demands were met. Last night security forces attacked the mosque, killing six people. On the 17th of March I headed to the airport, leaving Tripoli for safety reasons. The internet has been cut off in Libya since 3rd March, phone lines are very bad in all the cities, and some cities are totally isolated (no phone lines, no water, no electricity) – like Zawiya, Misurata, and now Benghazi’s too. God only knows what is coming next. 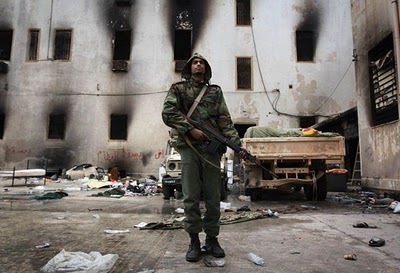 After we lost the internet, Tripoli became a prison of terror. 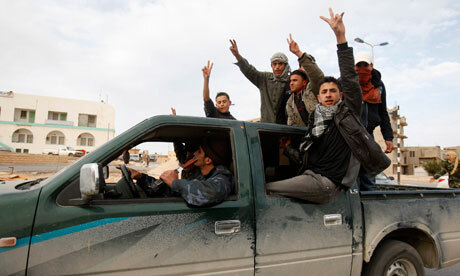 Qaddafi’s thugs are celebrating all the time, and every day gunfire starts and stops all of a sudden, at any second. Out of a complete silence, we see cars passing by our building playing very loud music, songs for Qaddafi. At other times (usually between 2 and 4 am) we hear gunfire that gradually increases, with no celebrations or cars chanting his name around the streets. Our correspondent in Tripoli, who’s been sending us such stirring and terriying reports, is now safe in Morocco. She is finally able to renounce her anonymity. She wants me to tell you her name in capital letters, NAFISSA ASSED, daughter of a martyr, proud Libyan citizen. Read her self-description after the break. It certainly feels uncomfortable to watch American, British and French planes enforcing a no-fly zone over Libya, bombing Libya’s anti-aircraft defences and destroying Libyan tanks. 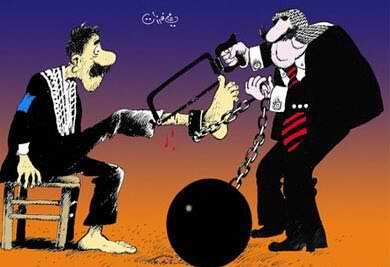 Certainly the hypocrisy of the West and the Arab dictators is as galling as ever. There’s no chance of a no-fly zone over Palestine and Lebanon, nor over Saudi-occupied Bahrain. I can understand very well the fears of some that the West will overstay its welcome – although I think this is very unlikely indeed. I am pleased, however, that the joint British-French-Lebanese (with Hizbullah in government in Lebanon) resolution for the no-fly zone has been adopted by the United Nations, that the massacres of the Libyan people may be minimised or stopped, that liberated Benghazi will probably not now fall to the tyrant. If Britain, France and others are seeking influence in post-Qaddafi Libya by pleasing the Libyan people, that’s fine by me. Perhaps they fear their companies being banned from Libya as a punishment for supporting the dictator, and they are taking this opportunity to make amends. Again, fine. This is how things are done between strong, free countries which respect each other. It’s not the same as, for instance, Western powers arming and politically supporting the Saud family in return for military bases which are hated by the Saudi Arabian population.